When Super Typhoon Haiyan struck the Philippines on November 8, 2013, it pounded the island of Leyte with winds near 315 kilometers (195 miles) per hour and a tremendous storm surge. In Tacloban, winds blew a wall of water ashore that may have been as much as 7.5 meters (24.6 feet) high. Much of the city sits less than 5 meters (16 feet) above sea level. These false-color images hint at the impact of the storm surge and winds on the city. The Advanced Spaceborne Thermal Emission and Reflection Radiometer (ASTER) on NASA’s Terra satellite acquired these images on November 15, 2013 (top) and April 3, 2004 (lower)—the last mostly cloud-free ASTER view of the city. Plant-covered land is red; urban areas are white and silver; bare ground is tan; and water and shadows are black. From ASTER’s wide perspective, it is not possible to see individual city blocks of destroyed buildings. But the subtle differences between the images do reveal a wide-scale disaster. This pair of images demonstrates both the challenge and the value in mapping disasters with satellite data. The images give a view of the entire city and its surroundings, a view that would otherwise be very difficult to obtain. On the other hand, some of the change is ambiguous and requires ground-based information to understand. For more tips on interpreting satellite images, see the Earth Observatory’s new feature, How to interpret a satellite image: Five tips and strategies. Associated Press (2013, November 11) Haiyan storm surges caught Philippines by surprise. Accessed November 19, 2013. BBC News (2013, November 12) Tacloban: City at the center of the storm. Accessed November 19, 2013. BBC News (2013, November 12) Typhoon Haiyan: Storm surge destroys house in seconds. Accessed November 19, 2013. Dutch Water Sector (2013, November 12) Typhoon Haiyan pushed devastating 5 m high storm surge into Tacloban City, Philippines. Accessed November 19, 2013. European Commission Copernicus Emergency Management Service (2013, November 11) Tacloban City – Philippines Typhoon Haiyan – 08/11/2013 grading map – overview. Published on ReliefWeb. Accessed November 19, 2013. Hurricane Hal’s Storm Surge Blog (2013, November 15) Haiyan storm surge estimates improve through shared observations. Accessed November 19, 2013. NASA Jet Propulsion Laboratory (2013, November 13) NASA-generated damage map to assist with Typhoon Haiyan disaster response. Accessed November 19, 2013. New York Times (2013, November 16) In worst-hit area of Tacloban, a killer from two sides. Accessed November 19, 2013. New York Times (2013, November 11) Mapping the destruction of Typhoon Haiyan. Accessed November 19, 2013. New York Times (2013, November 11) Pictures of Typhoon Haiyan’s wrath. Accessed November 19, 2013. UN Office for the Coordination of Humanitarian Affairs (2013, November 18) Philippines: Typhoon Haiyan (Yolanda) infrastructure – Tacloban City (as of 15-Nov-2013). Published on ReliefWeb. Accessed November 19, 2013. NASA image courtesy Ken Duda, U.S. Geological Survey (USGS) Earth Resources Observation and Science (EROS) Center. Caption by Holli Riebeek. Haiyan, known locally in the Philippines as Yulonda, will go down as a historic storm, making landfall in the central Philippines as perhaps the most powerful tropical cyclone to ever make landfall with sustained winds estimated at 195 mph (~315 kph). So far, over 2300 people are confirmed to have been killed by the storm, and the number is likely to climb higher with many still missing and not all areas unaccounted for. Katrina, which devasted the US Gulf coast in 2005, was responsible for 1833 fatalities. The most deadly flooding from Super Typhoon Haiyan was caused by the storm surge, which was reported to be up to 5.2 meters (~17 feet) in Tacloban, located on the northeast tip of Leyte, where the strong cyclonic winds from Haiyan funneled water into the northwest corner of Leyte Gulf between the islands of Leyte and Samar. In addition to the fierce winds and powerful surge, Haiyan brought copious amounts of rainfall to the central Philippines along with Tropical Storm Thirty and another tropical disturbance (90w), which all passed through the the central Philippines within in the past ten days. The combined rainfall from these tropical cyclones (first image to the right) in the TRMM-based, near-real time Multi-satellite Precipitation data (TMPA) analysis shown above during the period from November 2-12, 2013. It shows that most of the island of Leyte had rainfall totals greater than 500mm (~19.7 inches, dark red) with a peak amount of over 685 mm (~27 inches, lighter purple) located over the southeast corner of the island. Peak and average rainfall over the central Philippines (second image to the right) shows that despite being far less intense, Tropical Storm Thirty, which preceded Super Typhoon Haiyan by about three days, produced similar peak rain intensities (shown in red) and over a similar duration, but less average rainfall (shown in blue) than Haiyan. When Super Typhoon Haiyan, one of the most powerful storms ever recorded on Earth, struck the Philippines Nov. 8, 2013, it tore a wide swath of destruction across large parts of the island nation. To assist in the disaster response efforts, scientists at NASA's Jet Propulsion Laboratory, Pasadena, Calif., in collaboration with the Italian Space Agency, generated this image of the storm's hardest-hit regions, depicting its destruction. 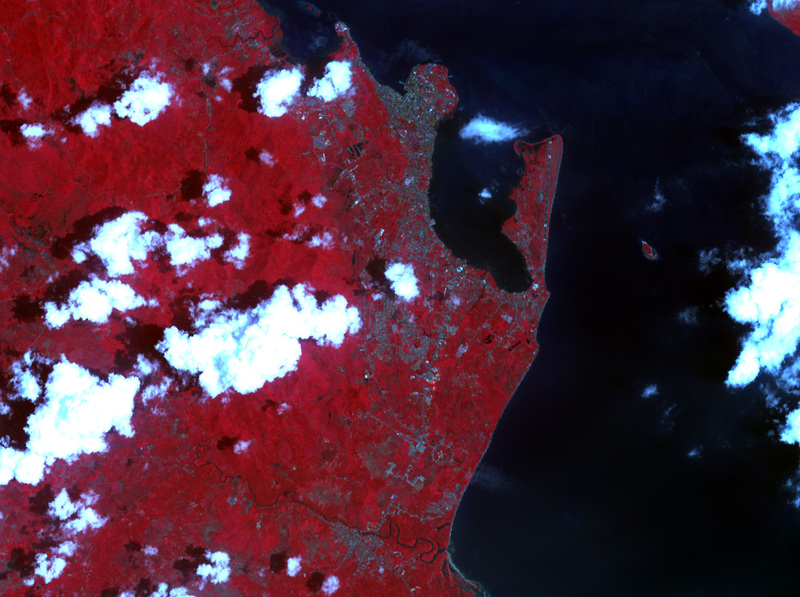 The 40-by-50 kilometer damage proxy map, which covers a region near Tacloban City, where the massive storm made landfall, was processed by JPL's Advanced Rapid Imaging and Analysis (ARIA) team using X-band interferometric synthetic aperture radar data from the Italian Space Agency's COSMO-SkyMed satellite constellation. The technique uses a prototype algorithm to rapidly detect surface changes caused by natural or human-produced damage. The assessment technique is most sensitive to destruction of the built environment. When the radar images areas with little to no destruction, its image pixels are transparent. Increased opacity of the radar image pixels reflects damage, with areas in red reflecting the heaviest damage to cities and towns in the storm's path. The time span of the data for the change is Aug. 19--Nov. 11, 2013. Each pixel in the damage proxy map is about 30 meters across. ARIA is a JPL- and NASA-funded project being developed by JPL and Caltech. It is building an automated system for providing rapid and reliable GPS and satellite data to support the local, national, and international hazard monitoring and response communities. 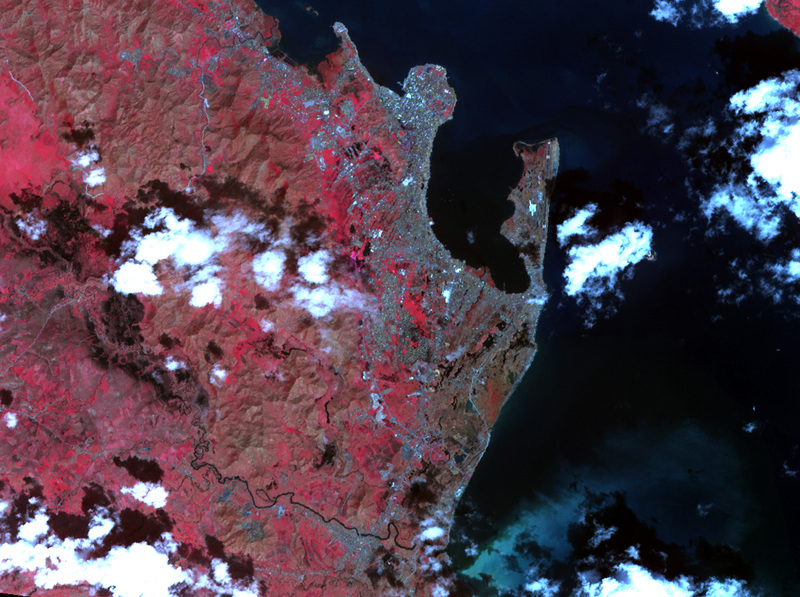 Using space-based imagery of disasters, ARIA data products can provide rapid assessments of the geographic region impacted by a disaster, as well as detailed imaging of the locations where damage occurred. NASA's Tropical Rainfall Measuring Mission or TRMM satellite can measure rainfall from space and estimate potential flooding and landslides. An animation of TRMM rainfall data was created at NASA's Goddard Space Flight Center in Greenbelt, Md. to map that rainfall. A TRMM animation of flood potential from Nov. 2 to Nov. 12 showed the movement of Tropical Storm 30W, Typhoon Krosa and Super-Typhoon Hainan in the western North Pacific Ocean. The animation showed the Tropical Storm 30W drenched the central Philippines days before Super-Typhoon Haiyan made landfall and increased flood potential to "high." Haiyan made landfall in northeastern Vietnam and on Nov. 11 at 2100 UTC/4 p.m. EDT with maximum sustained winds of 75 miles/120 km per hour, and continued moving northeast through southern China. Satellite data showed the extent of the tropical storm's cloud cover that stretched from northeastern Vietnam over southeastern China. On Nov. 10 at 03:30 UTC/Nov. 9 at 10:30 p.m. EDT, the Moderate Resolution Imaging Spectroradiometer or MODIS instrument aboard NASA's Terra satellite showed the center of Typhoon Haiyan was just south of Hainan Island, China in the South China Sea. Later in the day, Haiyan moved north of Hainan Island and headed for a landfall in extreme northeastern Vietnam. Haiyan's maximum sustained winds were near 75 knots/86 mph/138.9 kph. At 1500 UTC/10 a.m. EDT on Nov. 10. At that time it was centered near 19.8 north and 107.9 east, about 160 nautical miles southeast of Hanoi, Vietnam, and moving to the north-northwest at 17 knots/19/5 mph/31.48 kph. According to RT news.com more than 174,000 households were evacuated, which is about 600,000 people. Haiyan was forecast to make landfall on Nov. 11 at 0000 UTC/8 a.m. Nov 8 local time/(7 p.m. EST Nov. 10), near the Cam Pha District, which is over 100 miles east of Hanoi. Early on Nov. 11, Haiyan made landfall in extreme northeastern Vietnam, as predicted. On Nov. 11 at 0300 UTC/10 a.m. Vietnam local time/Nov. 10 at 9 p.m. EDT Haiyan was moving over land and its maximum sustained winds were still near 60 knots/69 mph/111.1 kph. The center of the tropical storm was located near 22.2 north and 107.4 east, just 87 nautical miles northeast of Hanoi, Vietnam. Haiyan was moving to the north at 13 knots/14.9 mph/24.0 kph. Animated enhanced infrared satellite imagery showed the storm was weakening quickly while over land and that bulk of the thunderstorms (and convection) had been pushed north of the center as a result of increasing winds shear from the southwest. On Nov. 11 at 05:45 UTC, the Moderate Resolution Imaging Spectroradiometer or MODIS instrument aboard NASA's Aqua satellite captured an image of Tropical Storm Haiyan over mainland China. The MODIS image showed the extent of cloud cover from northeastern Vietnam over the Guangxi, Guangdong, Hunan, Guizhou, Sichuan, Chongqing, Hubei, Shaanxi, Henan, Anhui and Jaingxi provinces. Mid-latitude westerly winds moving over China helped weaken the storm. Haiyan is forecast to turn to the east and dissipate in the next day. The Moderate Resolution Imaging Spectroradiometer (MODIS) on NASA’s Terra satellite captured this image of Typhoon Haiyan just south of Hainan Island, China and approaching Vietnam on November 10, 2013. The storm was tracking northwest and slowly weakening prior to landfall in northern Vietnam on Sunday evening (Monday morning, local time). As of early Sunday morning, the storm had maximum sustained winds of about 90 miles (145 kilometers) per hour, the equivalent of a category 1 storm. Haiyan crossed the Philippines as a Super-Typhoon and headed for Indochina in early November 2013. Super-typhoon Haiyan, equivalent to a Category 5 hurricane on the U.S. Saffir-Simpson scale, struck the central Philippines municipality of Guiuan at the southern tip of the province of Eastern Samar early Friday morning at 20:45 UTC (4:45 am local time). NASA's TRMM satellite captured visible, microwave and infrared data on the storm. Haiyan made landfall as an extremely powerful super typhoon, perhaps the strongest ever recorded at landfall, with sustained winds estimated at 195 mph (315 kph) by the Joint Typhoon Warning Center. Previously, Hurricane Camille, which struck the northern Gulf Coast in 1969, held the record with 190 mph sustained winds at landfall. After striking Samar, Haiyan quickly crossed Leyte Gulf and the island of Leyte as it cut through the central Philippines. NASA's Tropical Rainfall Measuring Mission or TRMM satellite captured an image of Haiyan just as it was crossing the island of Leyte in the central Philippines. Data was taken at 00:19 UTC (8:19 a.m. local) November 8, 2013 and showed the horizontal distribution of rain intensity within the Haiyan. Rain rates in the center of the swath were generated from the TRMM Precipitation Radar (PR), and those in the outer swath were from the TRMM Microwave Imager (TMI). The data was put together at NASA's Goddard Space Flight Center in Greenbelt, Md. where rain rates were overlaid on infrared (IR) data from the TRMM Visible Infrared Scanner (VIRS). It showed that Haiyan still had a well-defined eye surrounded by a symmetric area of moderate rain with several rainbands wrapping in from the south. The symmetric rain area around the eye is a testament to the storm's intensity--the stronger the storm, the more the features are smeared uniformly around the center. At the time of the image, Haiyan's sustained winds were estimated to have dropped slightly to 160 knots/~185 mph from crossing Leyte. TRMM passed over Haiyan about 10 hours later on Nov. 8 at 10:08 UTC/5:08 a.m. EDT/6:08 p.m. Philippines local time. Haiyan was passing south of Mindoro as it was beginning to exit the Philippines. The center was less organized after having passed over the larger Philippines island of Panay, although a large area of heavy rain (shown in red) is now located just south of the center. At the time of this image, Haiyan's intensity was estimated to be 145 knots/~167 mph, still equivalent to a Category 5 hurricane. TRMM is a joint mission between NASA and the Japanese space agency JAXA. On Nov. 8 at 1500 UTC/11 a.m. EDT/12 a.m. Nov. 9 Philippines local time, Haiyan's maximum sustained winds had dropped to 135 knots/155.4 mph/250 kph. It slowed a bit, moving to the west at 20 knots/23.0 mph/37.0 kph. Although Haiyan was centered near 11.8 north and 120.6 east, about 170 miles south of Manila, its extent covered most of the Philippines. So far, four fatalities have been reported as a result of the storm, but these are preliminary as communication to many areas was knocked out. Haiyan is expected to continue moving in a general westward direction over the next 1 to 2 days before likely striking central Vietnam. Super-Typhoon Haiyan slammed into the eastern Philippines as the strongest tropical cyclone of the year, and today, Nov. 8, is exiting the country and moving into the South China Sea. NASA's Aqua satellite captured visible and infrared data of Hiayan after it made landfall near Leyete, identifying the extent of its power. The U.S. Navy's Joint Typhoon Warning Center noted that just before Super-Typhoon Haiyan made landfall its maximum sustained winds were 314 kph/195 mph, with gusts up to 379 kph/235 mph. PAGASA, the Philippines Weather organization noted that Hiayan's maximum sustained winds at landfall were near 234 kph/145 mph. On Nov. 7 at 2100 UTC/4 p.m. EDT/Nov. 8 at 5 a.m. Philippines local time, Super-Typhoon Haiyan had maximum sustained winds near 170 knots/ 195.6 mph/314.8 kph. It was located about 543 nautical miles east-southeast of Manila at that time. As Super-Typhoon Haiyan moved over the central Philippines on Nov. 8 at 05:10 UTC/12:10 a.m. EDT, the Moderate Resolution Imaging Spectroradiometer or MODIS instrument aboard NASA's Aqua satellite captured a visible image. The image showed that Haiyan maintained its structure as it moved over the east central Philippines. As the center moved through the eastern Visayas, large, thick bands of thunderstorms spiraled into the center from the northeast. Hiayan's clouds extended over the entire country from the Cagayan Valley in the north to the Soccsksargen region in the south. The AIRS instrument that also flies aboard NASA's Aqua satellite captured infrared imagery of Super-Typhoon Haiyan exiting the western Philippines. The coldest cloud top temperaetures and most powerful thunderstorms with heavy rainfall potential covered the Visayas, Bicol, National Capital, Central Luzon, Calabarzon, Northern Mindanao, and Mimaropa regions. By Nov. 8 at 0900 UTC/4 a.m. EDT/5 p.m. Philippines local time, Haiyan's maximum sustained winds dropped to 145 knots/167 mph/268.5 kph, still making it a powerful Category 5 tropical cyclone on the Saffir-Simpson Scale. It was moving through Western Visayas and was 214 nautical miles south-southeast of Manila. It is moving quickly to the west at 22 knots/25.3 mph/40.74 kph, which will reduce flooding potential. [image-186]Many warnings are still in effect today, Nov. 8, as Hiayan continues to exit the western Philippines. Public storm warning signals have been raised in large areas of the country. In Luzon, Signal #1 was in effect for: Metro Manila, Bataan, Cavite, Rizal, Laguna, Quezon, Camarines provinces, Albay, Sorsogon. Signal #2 is in effect for: Lubang Island, Batangas, Marinduque, rest of Palawan, Burias Island, Masbate and Ticao Island; Signal #3 in effect for the rest of Mindoro provinces, Romblon, rest of northern Palawan including Puerto Princesa City; and Signal #4 is in effect for: extreme northern Palawan, Calamian Group of Islands, southern Occidental and Oriental Mindoro. In Visayas, Signal #1 remained in effect for: Samar provinces, Leyte provinces, Camotes island, Bohol and Siquijor; while Signal #2 is up for: Negros provinces, Cebu, Biliran Island; and there is no Signal #3, but there is a Signal #4 for Aklan, Capiz, Antique, Iloilo and Guimaras. In Mindanao, a Signal #1 remained in effect for the Camiguin, Surigao del Norte, Dinagat; and a Signal #2 is up for: Siargao. According to PAGASA, the Philippine authority on meteorology, flashfloods and mudslides are possible in areas under signal #2, 3 and 4. In addition, storm surges of up to 21 feet/~7 meters are possible under a Signal #2. CNN reported on Nov. 9 that Hiayan left power outages, flooded streets, downed trees, damaged buildings and many canceled flights. The U.S. Navy's Joint Typhoon Warning Center in Hawaii said it was the strongest tropical cyclone in the world this year. Hiayan is forecast to move through the South China Sea and make a final landfall as a strong typhoon in central Vietnam in a couple of days. Super-Typhoon Haiyan was lashing the central and southern Philippines on Nov. 7 bringing maximum sustained winds of a Category 5 hurricane. NASA is providing visible, infrared and microwave satellite data to forecasters and warnings are in effect for the Philippines and Micronesia as Haiyan moves west. Brian McNoldy, a Senior Research Associate at the University of Miami's Rosenstiel School of Marine and Atmospheric Science in Miami, Fla. noted that on the morning (EST) of Nov. 7, "Haiyan has achieved tropical cyclone perfection. It is now estimated at 165kts (190mph), with an 8.0 on the Dvorak scale... the highest possible value." Signal #1 is in effect for : Camarines Norte & Sur, Catanduanes, Mindoro Provinces, Marinduque, Northern Palawan, Calamian Group of Islands, and Southern Quezon. Signal #2 is in effect for: Romblon, Sorsogon, Albay, Ticao and Burias island. In Visayas, Signal #1 is in effect for Squijor, and Signal #2 is in effect for: Bohol, Negros Occidental and Oriental, Aklan, Capiz, Antique, rest of Cebu, Iloilo and Guimara. Signal #3 is in effect for: Northern Samar, Masbate, northern Cebu, Cebu City and Bantayan island, and Signal #4 is in effect for: Eastern Samar, Samar, Leyte, Southern Leyte and Biliran island. In Mindanao, Signal #1 was posted for: Misamis Oriental, Agusan del Sur; Signal #2 for: Camiguin, Surigao del Norte & Sur and Agusan del Norte and Signal #3 is in effect for: Siargao Island and Dinagat province. In Micronesia, a Typhoon Warning is in effect for Kayangel and Koror in the Republic of Palau and Ngulu in Yap State. Early on Nov. 7, NASA's Aqua satellite passed over Super Typhoon Haiyan as it was approaching the Philippines. The Moderate Resolution Imaging Spectroradiometer or MODIS instrument aboard captured a visible image on Nov. 7, 2013 at 04:25 UTC/Nov. 6 at 11:25 p.m. EDT that showed the thick bands of powerful thunderstorms that surrounded the eye. The MODIS image also revealed a powerful, wide band of thunderstorms in the western quadrant that was affecting the Philippines in the early morning hours (Eastern Daylight Time/U.S.) on Nov. 7. At the same time, another instrument aboard Aqua captured infrared data on the storm using the Atmospheric Infrared Sounder or AIRS instrument, providing cloud top temperatures and sea surface temperatures. The infrared data revealed a sharply defined eye with multiple concentric rings of thunderstorms and a deep convective eyewall. The infrared data showed cloud top temperatures as cold as 210 degrees kelvin/-81.67F/-63.15C/ in the thick band of thunderstorms around the center. Those cold temperatures indicate very high, powerful thunderstorms with very heavy rain potential. On Nov. 7 at 1500 UTC/10 a.m. EDT, Super-Typhoon Haiyan's maximum sustained winds were near 165 knots/189.9 mph/305.6 kph. Haiyan is a Category 5 storm on the Saffir-Simpson hurricane scale. The Joint Typhoon Warning Center estimated that gusts are as strong as 200 knots/ 230.2 mph/370.4 kph. The U.S. National Hurricane Center website indicates that a Category 5 hurricane/typhoon would cause catastrophic damage: A high percentage of framed homes will be destroyed, with total roof failure and wall collapse. Fallen trees and power poles will isolate residential areas. Power outages will last for weeks to possibly months. Most of the area will be uninhabitable for weeks or months. Haiyan was located near 10.4 north latitude and 128.1 east longitude, about 543 nautical miles east-southeast of Manila, Philippines. It is moving west-northwest at 22 knots/25.3 mph/40.7 kph and generating extremely rough seas with wave heights to 50 feet/15.2 meters. The Joint Typhoon Warning Center noted that extremely favorable environmental conditions such as the warm waters ahead of the system will help to maintain its strength at super typhoon intensity through landfall in the central Philippines and up to 1500 UTC/10 a.m. EDT on Nov. 8. According to forecast track, Manila is now expected to be impacted by the northeastern quadrant, the strongest side of the storm. After passing through the Philippines, Haiyan is expected to move through the South China Sea as it heads for landfall in Vietnam. Super Typhoon Haiyan continues moving toward the Philippines, and when NASA's TRMM satellite passed overhead, it was very close to the island of Palau and packing heavy rainfall. Haiyan is now equivalent to a Category 5 Hurricane. The forecasters at the Joint Typhoon Warning Center or JTWC accurately predicted that Typhoon Haiyan would become a powerful category five typhoon with sustained winds estimated to be over 135 knots/~155 mph. On Nov. 6, a typhoon Warning remained in effect for Kayangel and Koror in the Republic of Palau and Ngulu in Yap State and a tropical storm warning was in effect for Yap Island in Yap State. Super typhoon Haiyan was located just northeast of Palau when the TRMM or Tropical Rainfall Measuring Mission satellite flew above on November 6, 2013 at 1026 UTC/5:26 a.m. EST. At NASA's Goddard Space Flight Center in Greenbelt, Md. a rainfall analysis from TRMM's Microwave Imager (TMI) and Precipitation Radar (PR) instruments was overlaid on an enhanced infrared image from TRMM's Visible and InfraRed Scanner (VIRS). The data revealed that rain was falling at a rate of over 100mm/~3.9 inches per hour around Haiyan's eye. Satellite data also showed a persistent ring of deep convection around the small eye. Haiyan's eye appeared to be about 8 nautical miles in diameter. The TRMM satellite's microwave data showed an intense convective core (thunderstorms building around the eye) and improved convective banding of thunderstorms in all quadrants of the super-typhoon. At 1500 UTC/10 a.m. EDT, Super Typhoon Haiyan had maximum sustained winds near 140 knots/161 mph/259 kph. That makes Haiyan equivalent to a Category 5 Hurricane on the Saffir-Simpson hurricane scale. Hiayan's center was located near 8.1 north and 135.4 east, about 113 nautical miles/130 miles/209.3 km east-northeast of Koror, Palau. It is moving to the west at 18 knots/20.7 mph/33.4 kph and generating 43-foot/13.1-meter-high seas. Super typhoon is expected to make landfall over the central Philippines just slightly on Nov. 8 and will slightly weaken as it tracks across the islands before emerging in the South China Sea. As Typhoon Haiyan has been strengthening, NASA's TRMM satellite investigated how much rain was falling throughout the storm. Typhoon Haiyan is now closing in on Yap and Palau with a forecast to move through the central Philippines, so all of those areas are under warnings and watches. NASA's Tropical Rainfall Measuring Mission satellite known as TRMM passed over Typhoon Haiyan on Nov. 4 at 1042 UTC/5:42 a.m. EDT. TRMM's Precipitation Radar instrument provided data on rainfall in the storm's northeastern quadrant. Rainfall near the center appeared to be falling at a rate of between 50 and 60 mm/1.9 and 2.3 inches per hour. Rainfall outside the center was falling between 10 and 30 mm/0.39 and 1.18 inches per hour. TRMM also saw that some of the thunderstorms were reaching heights over 10 km/6.2 miles high. On Nov. 5 at 1500 UTC, Haiyan's maximum sustained winds increased to 90 knots/103.6 mph/166.7 kph, and are forecast to increase more over the next several days. Haiyan is centered near 6.9 north and 142.3 east, about 333 nautical miles/ 383.2 miles/616 km east-southeast of Yap. The typhoon is moving to the west-northwest at 15 knots/ 17.2 mph/27.7 kph. A Typhoon Warning is in effect for Kayangel in the Republic of Palau and Ngulu in Yap State, and a Typhoon Watch is in effect for Fais, Ulithi, in Yap State. In addition, a Tropical Storm Warning remains in effect for Yap Island in Yap State and Koror in Palau. Forecasters at the Joint Typhoon Warning Center or JTWC who provide the bulletins and forecasts on the storm noted on Nov. 5 that animated enhanced infrared satellite imagery showed the Haiyan was intensifying quickly and bands of thunderstorms wrapping into the center were strengthening. There was a strong band of thunderstorms wrapping around the western semi-circle and into an eye detected by microwave satellite data. JTWC expects the storm to intensify rapidly over the next two to three days as it moves through the Philippine Sea. NASA's Aqua satellite passed over Tropical Storm Haiyan on Nov. 4 and infrared data showed a large area of powerful thunderstorms affecting Micronesia. The Joint Typhoon Warning Center has forecast newborn Tropical Storm Haiyan to strengthen to a powerful typhoon before making landfall in the Philippines on Nov 8. In its orbit around the Earth, NASA's Aqua satellite passed over Tropical Storm Haiyan on Nov. 4 at 0347 UTC/10:47 p.m. EDT on Nov. 3. The Atmospheric Infrared Sounder or AIRS instrument captured infrared data that measured cloud top temperatures in the strengthening tropical storm. AIRS data showed a large area of strong convection with high, cold cloud tops. Temperatures exceeded -63F/-52C over a large area. Satellite data shows that the convection, the rising air that forms the thunderstorms that make up the tropical cyclone, have deepened, or strengthened over the previous 24 hours. Microwave imagery from NASA's Tropical Rainfall Measuring Mission or TRMM satellite shows improved banding of thunderstorms wrapping around the tropical storm today, Nov. 5. Haiyan is lashing the islands of Micronesia and warnings and watches are in effect today, Nov. 5. Micronesia consists of a group of islands in the western Pacific Ocean that include the Marshall Islands, the Gilbert Islands including Kiribati, the Caroline Islands, Nauru, Wake Island and the Mariana Islands. The area contains thousands of small islands and is part of the larger Oceana. A Typhoon Warning is in effect for Woleai in Yap State. A Typhoon Watch is in effect for Koror and Kayangel, Republic of Palau; for Satawal in Yap State; and for Faraulep, Fais, Ulithi, Yap Island and Ngulu in Yap State. A Tropical Storm Warning has been posted for Puluwat in Chuuk State as well as for Satawal in Yap State, and a tropical storm Watch is up for Ulul and Fananu in Chuuk State. On Nov. 5 at 1500 UTC/10 a.m. EDT Haiyan's maximum sustained winds were near 45 knots/51.7 mph/83.3 kph and it is moving through an area of warm waters and low wind shear which is expected to help the storm strengthen. Haiyan was centered near 6.2 north and 147.6 east about 640 nautical miles east-southeast of Yap. Haiyan is moving to the west at 19 knots/21.8 mph/35.9 kph. Haiyan is moving west-northwest through Micronesia. It is expected to pass between Yap and Palau on Nov. 6 before making landfall in the central Philippines. The Joint Typhoon Warning Center expects Haiyan to intensify to 120 knots/138.1 mph/222.2 kph as it approaches the central Philippines on Nov. 8. That strength is equal to a Category 4 hurricane on the Saffir-Simpson Scale. Typhoon Haiyan pounding Hainan Island, China. Astronauts aboard the International Space Station captured this footage of Super Typhoon Haiyan from space. The sound in the background is chatter from the Russian cosmonauts. The ASTER instrument aboard NASA’s Terra satellite acquired this image of the island of Leyte, Philippines on Nov. 15, 2013. The ASTER instrument aboard NASA’s Terra satellite acquired this image of the island of Leyte, Philippines on April 3, 2004. This visible image of Super Typhoon Haiyan approaching the Philippines was taken from the MODIS instrument aboard NASA's Aqua satellite on Nov. 7, 2013 at 04:25 UTC/Nov. 6 at 11:25 p.m. EDT. NASA's Aqua satellite passed over Tropical Storm Haiyan on Nov. 4 at 0347 UTC/10:47 p.m. EDT on Nov. 3 as it was lashing the islands that make up Micronesia in the western North Pacific Ocean. On Nov. 4, NASA's TRMM satellite found precipitation falling at a rate of about 50 and 60 mm/1.9 and 2.3 inches per hour near Typhoon Haiyan's center and between 10 and 30 mm/0.39 and 1.18 inches per hour outside the center. Data from TRMM's TMI and PR instruments on Nov. 6 at 1026 UTC revealed that rain was falling at a rate of over 100mm/~3.9 inches per hour (purple) around Haiyan's eye. Data from TRMM's TMI and PR instruments on Nov. 6 at 1026 UTC revealed that rain was falling at a rate of over 100mm/~3.9 inches per hour (purple)around Haiyan's eye. NASA AIRS infrared data showed cloud top temperatures as cold as 210 degrees kelvin/-81.67F/-63.15C/ in the thick band of thunderstorms around the center. Those cold temperatures indicate very high, powerful thunderstorms with very heavy rain potential. This animation of MTSAT satellite data shows the progression of Super-Typhoon Haiyan on Nov. 7 from 0930 UTC to 1530 UTC as it began moving over the Philippines. The AIRS instrument aboard NASA's Aqua satellite captured this infrared, false-colored image of Super-Typhoon Haiyan exiting the western Philippines on Nov. 8 at 04:59 UTC. Purple indicates coldest, most powerful thunderstorms with heavy rainfall potential. NASA's TRMM satellite data on Nov. 8 at 00:19 UTC showed Haiyan had a well-defined eye surrounded by a symmetric area of moderate rain (green ring with a blue center) with several rainbands wrapping in from the south (green arcs) while crossing the island of Leyte in the central Philippines. TRMM saw Haiyan's center was less organized after having passed over the larger Philippines island of Panay, although a large area of heavy rain (shown in ed) is now located just south of the center. Haiyan was estimated to be 145 knots (~167 mph), still equivalent to a Category 5 hurricane. On Nov. 11 at 05:45 UTC, the MODIS instrument aboard NASA's Aqua satellite captured this image of Tropical Storm Haiyan over mainland China. On Nov. 10 at 03:30 UTC/Nov. 9 at 10:30 p.m. EDT, the MODIS instrument aboard NASA's Terra satellite showed the center of Typhoon Haiyan just south of Hainan Island, China in the South China Sea. TRMM animation of flood potential from Nov. 2 to Nov. 12 shows the movement of Tropical Storm 30W, Typhoon Krosa and Super-Typhoon Hainan. Yellow is low, orange is medium, and red is high. The combined rainfall from these tropical cyclones is shown in this image during the period from November 2-12, 2013. Peak and average rainfall over the central Philippines shows that despite being far less intense, Tropical Storm Thirty, which preceded Super Typhoon Haiyan by about three days, produced similar peak rain intensities (red) and over a similar duration, but less average rainfall (blue) than Haiyan. TRMM satellite view of rainfall with the newly energized tropical disturbance in the Bay of Bengal on November 13, 2013. A 3-D view of 30W using data from TRMM's Precipitation Radar (PR) instrument.